Wavefront optics can dramatically improve vision for keratoconus and other conditions. The Laserfit process begins by non-invasively creating a digital model of the entire front surface of the eye, and then designing a custom lens to fit that model. That’s only the beginning. The process then goes on to create custom optics using patented wavefront technology. This technology has been shown to improve visual acuity and to reduce annoying or disabling visual distortions and artifacts. While ordinary scleral lenses can reduce them, they are not reduced to normal levels in a great many cases. Two recent cases are presented to demonstrate the value of Laserfit in Keratoconus. Both patients have advanced keratoconus and could not achieve acceptable vision in at least one eye with other lenses, including scleral lenses. We will discuss the results for only the more problematic eye of each of the two patients. The first case is a gentleman who had been fitted with various lenses in various countries. We measured the aberrations in his right eye. They were off the charts. We then measured the aberrations in his right eye with his own scleral lenses. The aberrations were very high at 2.079 microns compared to the norm of 0.327 microns (orders 3-6) for a 6.0 mm pupil according to Salmon. We then made him a Laserfit lens with patented wavefront optics. The total higher order aberrations were reduced to 0.516 microns, or a 75% reduction from the previous lens. This is within one standard deviation of the normal level. The following table shows the results, including those for other aberrations which were reduced by as much as 91%! 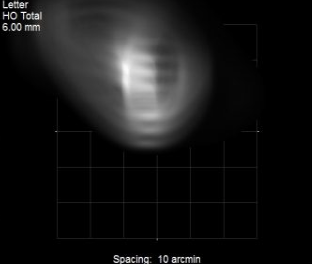 A very useful feature of our aberrometer is the ability to create a visual simulation of a light source or a Snellen letter as the patient sees it with the various lenses. Here are the simulated Snellen letters for Patient A for unaided (left), his own scleral lens (center), and Laserfit (right). Left to right: Unaided Snellen letter, with standard scleral lens, with Laserfit. These are representative results for keratoconus, with similarly dramatic results being achieved for LASIK and other conditions. The improvements in higher order aberrations are also accompanied by better visual acuity, which is improved by more than one line on average, and often by several lines.